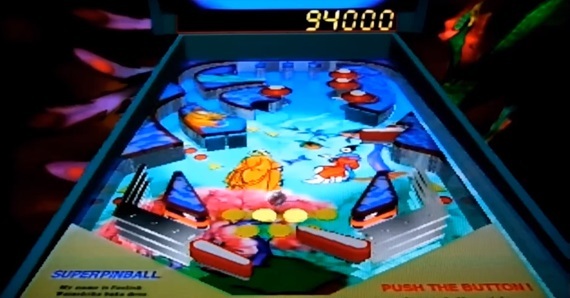 By 1994, video game pinball simulation was not a new thing; they had been going since the days of the Atari 2600 back in 1983, and the 8-bits saw their fair share too with the likes of Pinball Magic and Pinball Dreams. These were flat, 2D simulations so to have a fully scaled and detailed 3D table to play on through your telebox, well this sounded exciting to say the least. 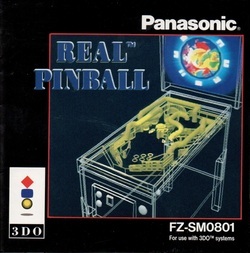 Real Pinball is one of the earliest efforts to attempt this, thanks to the high-end tech of the 3DO in the pre-PlayStation era. With potential to be a fine pinball outing, I feel this endeavoured far too much for the time, falling way short in many departments. The contentment of playing on an actual old-skool pinball table without the fancy graphics seems far more alluring once you’ve given this sloppy effort a play. Instantly obvious is a rather makeshift and disjointed intro and a very plain menu screen, with little in the way of attraction or something special. Next to no options are available, it’s just pick the first table and off you go. 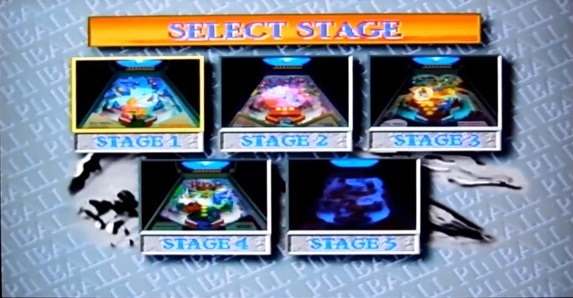 A total of five tables are included, all unlockable with achieving a set score of the previous table. Until the fourth table, this is not difficult to fulfil. It’s more of a problem persevering with the game to get to this stage, and that includes the dreadful loading times. I can accept that early CD games needed time to load, but each table takes the best part of a minute to render. After said finger-drubbing, you expect some great whizz-bang of a pinball table to pop up. No alas, this doesn’t happen. Although the 3D look is quite admirable and the shape, size and board details are in proportion, it all looks far too dark. The lighting used is just not correct, the contrast is poor and you find yourself having to squint slightly to make out certain scriptures and bonuses on the table. If this was done to highlight the bright lights and neons of the table, I could have forgiven it, but these are equally as dim save for a white or yellow flash. Adjusting the colour preferences on your TV doesn’t really help either, so this is an inherent visual handicap. The drawing is generally okay, and the sharpness of the lines is prevalent so it does look nice past the low light level. However, the camera angle of the table is just awkward and set to low. This causes big problems which distract and hamper the flow of play. The ball can become unsighted at many times, and targets, score points and bumpers are obscured so you can’t tell exactly what you are hitting. This combined with the most prominent gameplay problem just serves to drag the experience down to a crawl. Very irritating. Speaking of the most important issue, it is crying out from the moment you ping that ball onto the table: physics. It seems for some reason, this pinball game is set on a permanent slow motion. After the initial burst of speed as the ball enters the table, it rebounds and bounces off bumpers and your flippers at inconsistent and very dawdling speeds. It takes an age for the ball to travel the length of the table or to fall into a trap. When you need to flip it at speed, you can’t generate the power needed when you want. Even with perfect timing, it’s a lottery draw on weather the ball will actually move the way you intend. Adding to this, the perspective scaling on the ball itself is jerky and stuttered. This all contributes to a very ponderous and unexciting pinball game. Aside from the nice retro-chintz LED display at the top, the only other good points would be that the collision detection is sharp, scoring is enjoyable when you can and the flippers are responsive. Using the shoulder buttons on the 3DO controller is a boon, as it does bring you more into the game and generates an authentic ‘feel’ to playing an actual pinball table. Pinball screenies: looking the same since time immemorial. Audio is generally run-of-the-mill, with some neat and realistic SFX in game, in particular the flipper sounds, but nothing too special. The music is pretty awful and again, slow paced and wholly non-riveting, and creates a kind of standing in a lift mood to the proceedings. This is very disappointing for a game which bills itself to be a real simulation of arcade pinball. Ambient sounds of the arcade would have been welcome assisting a more 90’s electro theme tune for example. But, no we have instead oriental-inspired humdrum ditties which are not inspiring at all. 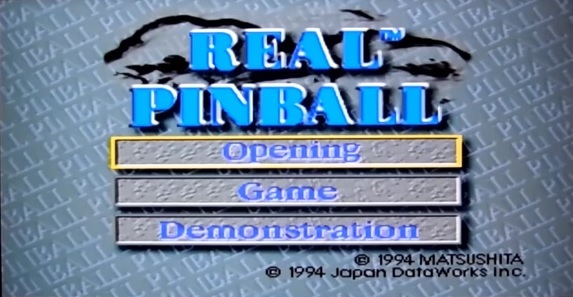 A big let-down in many areas, in no shape or form does Real Pinball live up to its name. Pinball is about quick reactions and timing, and when a simulation can’t get these basic premises right then it’s not going to end well. The 3D tables do give it some quality and originality even though they are designed poorly and lit badly, but with the sluggish ball movements and unpredictable nature of sighting the damn thing, drag this game down into the bargain basement bin of 3DO games. Predictably, the sheer tedious nature makes any replay value negligible, as it’s likely you will not return after a first play or reaching the fourth table (this is the most well-designed table anyway). Give me a copy of Pinball Dreams with its 2D reliability over this. PinBALLS!